I am working on a web application where I want the content to fill the height of the entire screen. For anything inside the content div, setting top: 0; will put it right underneath the header. Sometimes the content will be a real table, with its height set to 100%. Putting header inside content will not allow this to work. Is there a way to achieve the same effect without using the table? Elements inside the content div will have heights set to percentages as well. So something at 100% inside the div will fill it to the bottom. As will two elements at 50%. For instance, if the header takes up 20% of the screen's height, a table specified at 50% inside #content would take up 40% of the screen space. So far, wrapping the entire thing in a table is the only thing that works. There are two other answers briefly mentioning flexbox; however, that was more than two years ago, and they don't provide any examples. The specification for flexbox has definitely settled now. Note: Though CSS Flexible Boxes Layout specification is at the Candidate Recommendation stage, not all browsers have implemented it. WebKit implementation must be prefixed with -webkit-; Internet Explorer implements an old version of the spec, prefixed with -ms-; Opera 12.10 implements the latest version of the spec, unprefixed. See the compatibility table on each property for an up-to-date compatibility status. All major browsers and IE11+ support Flexbox. For IE 10 or older, you can use the FlexieJS shim. With flexbox you can easily switch between any of your rows or columns either having fixed dimensions, content-sized dimensions or remaining-space dimensions. In my example I have set the header to snap to its content (as per the OPs question), I've added a footer to show how to add a fixed-height region and then set the content area to fill up the remaining space. In the CSS above, the flex property shorthands the flex-grow, flex-shrink, and flex-basis properties to establish the flexibility of the flex items. Mozilla has a good introduction to the flexible boxes model. Once you can get this value and set the element's height, you need to attach event handlers to both the window onload and onresize so that you can fire your resize function. Also, assuming your content could be larger than the viewport, you will need to set overflow-y to scroll. The original post is more than 3 years ago. I guess many people who come to this post like me are looking for an app-like layout solution, say a somehow fixed header, footer, and full height content taking up the rest screen. If so, this post may help, it works on IE7+, etc. Instead of using tables in the markup, you could use CSS tables. 2) Markup is more semantic than tables, because this is not tabular data. 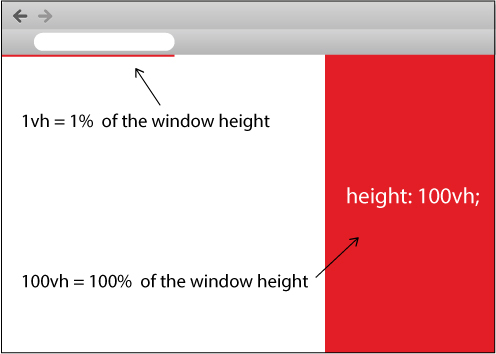 When you want the middle element to span across entire page vertically, you can use calc() which is introduced in CSS3. So here, what am doing is, adding up the height of elements and than deducting from 100% using calc() function. Just make sure that you use height: 100%; for the parent elements. all major browsers these days support it, so go ahead if you don't have requirement to support vintage browsers. I've been searching for an answer for this as well. If you are fortunate enough to be able to target IE8 and up, you can use display:table and related values to get the rendering rules of tables with block-level elements including div. If you are even luckier and your users are using top-tier browsers (for example, if this is an intranet app on computers you control, like my latest project is), you can use the new Flexible Box Layout in CSS3! Disclaimer: The accepted answer gives the idea of the solution, but I'm finding it a bit bloated with an unnecessary wrapper and css rules. Below is a solution with very few css rules. Solution above uses viewport units and flexbox, and is therefore IE10+, providing you use the old syntax for IE10. In all sane browsers, you can put the "header" div before the content, as a sibling, and the same CSS will work. However, IE7- does not interpret the height correctly if the float is 100% in that case, so the header needs to be IN the content, as above. The overflow: auto will cause double scroll bars on IE (which always has the viewport scrollbar visible, but disabled), but without it, the content will clip if it overflows. If you can deal with not supporting old browsers (that is, MSIE 9 or older), you can do this with Flexible Box Layout Module which is already W3C CR. That module allows other nice tricks, too, such as re-ordering content. Unfortunately, MSIE 9 or lesser do not support this and you have to use vendor prefix for the CSS property for every browser other than Firefox. Hopefully other vendors drop the prefix soon, too. An another choice would be CSS Grid Layout but that has even less support from stable versions of browsers. In practice, only MSIE 10 supports this. There's a ton of answers now, but I found using height: 100vh; to work on the div element that needs to fill up the entire vertical space available. In this way, I do not need to play around with display or positioning. This came in handy when using Bootstrap to make a dashboard wherein I had a sidebar and a main. I wanted the main to stretch and fill the entire vertical space so that I could apply a background colour. Giving you html and body (in that order) a height and then just give your elements a height? Just defining the body with display:grid and the grid-template-rows using auto and the fr value property. You can actually use display: table to split the area into two elements (header and content), where the header can vary in height and the content fills the remaining space. This works with the whole page, as well as when the area is simply the content of another element positioned with position set to relative, absolute or fixed. It will work as long as the parent element has a non-zero height. Vincent, I'll answer again using your new requirements. Since you don't care about the content being hidden if it's too long, you don't need to float the header. Just put overflow hidden on the html and body tags, and set #content height to 100%. The content will always be longer than the viewport by the height of the header, but it'll be hidden and won't cause scrollbars. I found a quite simple solution, because for me it was just a design issue. I wanted the rest of the Page not to be white below the red footer. So i set the pages background color to red. And the contents backgroundcolor to white. With the contents height set to eg. 20em or 50% an almost empty page won't leave the whole page red. I do use angular and I want my component sizes to be 100% of their parent element. The key is to set the size (in percents) for all parents inorder to limit their size. In the following example myapp height has 100% of the viewport. The main component has 90% of the viewport, because header and footer have 5%. This seems a cleaner solution than the popular flex box one for CSS3 enabled browsers. Simply use min-height(instead of height) with calc() to the content block. Here is a simple example of a header and footer using 50px height and 20px padding for both. Make div take up rest of space (height)? How to make an endless div after a fixed height div? A CSS way of using <br clear=all> on divs without heights? How to make a div fill its container with 100% width and height? How to make a div fill a remaining horizontal space?